People want comfort, a healthy and fresh indoor environment and great energy performance. These things are talked about by most building professionals but underpinning the passivhaus methodology there is scientific reasoning to define and set such things like what temperatures do humans find comfortable in a fully draft free environment, what is the optimum air change rate for human health whilst also achieving energy efficiency and what heat load should be achieved beyond which insulation levels and airtightness measures become too extreme to achieve benefit. The standard is extremely rigorous, but as a result unlike many other building energy measurements schemes the performance modelling has been proven to be very accurate. Auchineden Barn was of typical mid nineteenth century Scottish farm building construction being built of random rubble walls on foundations of large stones with a lime washed finish externally. The roof was of timber rafters with a high collar tie and sarking and a slate covering over. The building adjoined a converted barn in another ownership and the rear face of the barn was a boundary wall. 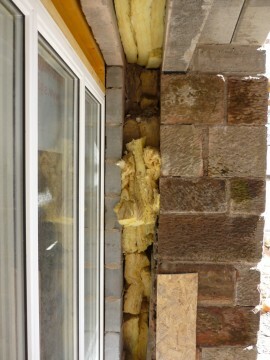 As it was not possible to insulate externally we were forced to develop an internal insulation solution. As internal insulation is inherently riskier this involved some complexity and great attention to detail of the vapour barrier and condensation calculations to ensure condensation would not occur in the wall structure. The solution involved a skin of aerated blockwork with mineral fibre insulation in a cavity and close cell insulation and a vapor barrier on the inside. Excavation of the floor to get 300mm of high-performance close cell ridged insulation under a new slab which was laid over a new sub floor slab which was required as a base for a tanking system which extended up above ground level as the building was below ground on two sides. 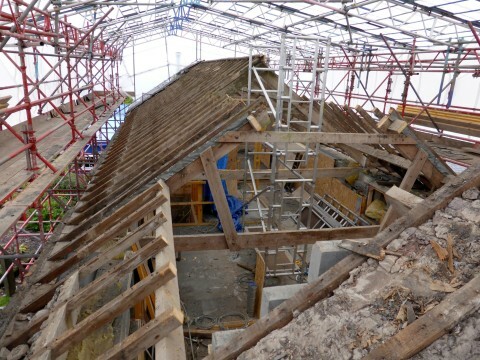 The plane of the roof could not be raised so the existing roof was replaced with a new I joist structure to contain 300mm of close cell ridged insulation with additional insulation under. The floor, wall, and roof u-values were all lower than 0.1W/m2K which some might see as extreme measures but when these issues were questioned it could be explained that there was a calculated basis for them and the traded benefits provided by these high levels of insulation such as a large North facing window to capture an important view could be understood. Other measures that were included were new triple glazed windows and doors from Slovenia, and quadruple glazed rooflights, mechanical ventilation and heat recovery, solar thermal and photovoltaic panels for hot water and electricity generation and, for comfort, one electric radiator in the hall and an electric towel rail in each bathroom. 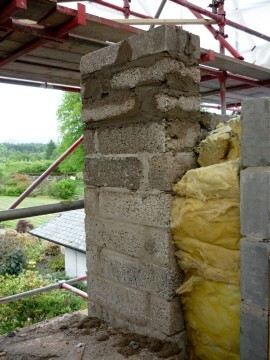 This technology is essential to get right in a passive house. It needs to be designed fully at the planning stage and the particular unit`s efficiency fed into the calculations at design stage. For those familiar with the figures the heat demand was 22 KW/m2perannum, (comfortably below the EnerPHit limit of 25) the heat load was 11W/m2 and the final air tightness test produced a result of 1 air change per hour at 50 pascals of pressure. The design and specification of the building was done in tandem with the PHPP energy modelling. 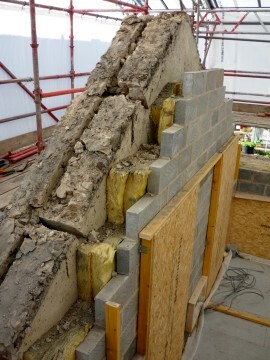 Achieving compliance for this building was not straight forward and many of the obvious measures that could have been done such as making the south facing openings larger were not available to us. 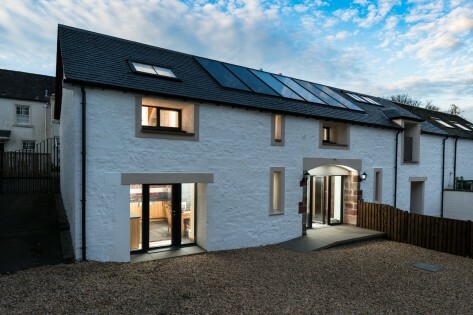 Certification: To get a passivhaus Building Certified requires that an independent qualified “passivhaus certifier” checks all of the passivhaus Planning Package software calculations carried out by the designer. Also, delivery note evidence must be submitted of all the relevant products used such as windows, doors, insulation, airtightness seals membranes and tapes, etc. Documentation of the airtightness tests and the mechanical ventilation and heat recovery system commissioning must also be submitted for checking, together with photographic evidence of the construction showing all of the stages from for example the insulation of the soil pipe drainage pipework under the floor slab to sealant of the insulation around the mechanical ventilation duct where it goes from the MVHR unit to the outside and everything in between. This degree of rigour is not something that the construction industry in Scotland is used to. It requires the contractor to fully embrace it and everyone on site to understand what is at stake. On this project we did briefing sessions with the contractor and arranged “toolbox talks” given by a representative of the airtightness products company. The rigour of the passivhaus methodology teaches the designer a great deal. This particular building was difficult due to its` modest size and the restriction of not being able to consider external insulation or even raising the roof. Some building types are much more suitable and will achieve compliance by adopting much more straightforward measures. There are many existing buildings that have robust structure, good proportions and internal special qualities, favourable orientation and other factors that make them eminently suitable to adapt to achieve high standards of comfort and energy performance. The EnerPHit Badge is recognised, but most users simply care about doing the best standard of upgrade that makes practical and economic sense to them. Knowing where the low hanging fruit hangs in terms of what gives the biggest gains in aesthetics, energy performance, and comfort, not to mention the urban regeneration potential of caring for an old building is what we do and apply, as we advise our clients. Urban Regeneration Schemes. Decision making at the critical early design stages of needs, an appreciation of building physics, architectural or aesthetic impact and simple economics. Focusing on one of these aspects without considering the others may lead down a route of diminishing returns and risk to the whole project viability.